infesting the Big Island and Maui. HILO >> Caffeine knocks Hawaii's screeching foreign frogs dead, a U.S. Department of Agriculture study has found. But the U.S. Environmental Protection Agency wants to know what else caffeine kills before the agency approves using it to stop the exploding population of two small frog species from Puerto Rico. 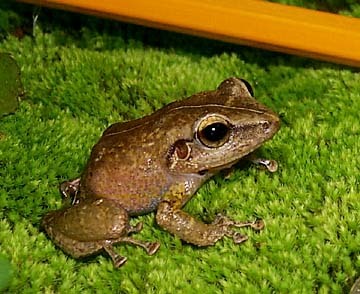 The two closely related amphibians are the coqui frog and the smaller greenhouse frog. Both are noisy, but the coqui, pronounced co-KEE after the sound they make, in numbers as high as 10,000 per acre produce a racket all night long as loud as a vacuum cleaner. Scientists are also worried that the frogs could spread pests on plant nursery products, wipe out native insects, and provide food for a population explosion of mongooses and rats. In 1998, only eight sites with the frogs were known on the Big Island. The number is now 150 sites, with another 40 on Maui. Only a handful of sites are known on Oahu and Kauai. Working in old sugar plantation offices on the edge of Hilo, USDA scientist Earl Campbell did laboratory tests on 35 substances to kill the frogs. Some surprisingly effective chemicals were acetominophen, ibuprofen and an aspirin-like substance, but the only one cheap enough for general use was caffeine. From November through April, Campbell field-tested caffeine in different strengths at seven Hilo-area plant nurseries. A 2 percent solution of caffeine and water killed 100 percent of the frogs, the studies showed. Comparing this to caffeine in cola, it is no wonder the frogs dropped dead. A 2 percent solution is about 125 times stronger than cola, said Lyle Wong of the state Department of Agriculture. The danger of high-concentration caffeine to people is clear. "Applicators participating in this study wore Tyvek suits, respirators and safety boots, gloves, and goggles to reduce accidental exposure to caffeine solutions," Campbell wrote in a draft report. When they were through spraying, besides dead frogs, the researchers found dead snails, slugs, toads and lizards. The state Department of Agriculture is preparing to ask the Environmental Protection Agency for an exemption that would allow it to bypass normal additional studies. The exemption would allow spraying within guidelines by trained personnel, he said. The EPA wants to know more about "nontarget mortality." The state proposes a procedure in which it would report on toad and snail deaths as it goes along. The state is requesting permission to use up to 480,000 pounds of caffeine on 400 acres for one year. The EPA wants to know what effect that will have on ground water. The state proposes to ban use of the caffeine mix near wells and drainage areas. Wong said, "There is an extraordinary need. There's no time to collect the data. We have no alternative." EPA officials told Wong a decision will take "a while."